Sabastiano Bonelli first appears in the Painesville, Ohio, area in 1909. Sabastiano Bonelli was born about 1861, at Licata, Sicily. He married Rosa Giordano in Italy. Sabastiano died on December 8, 1909, at Painesville, Lake County, Ohio. 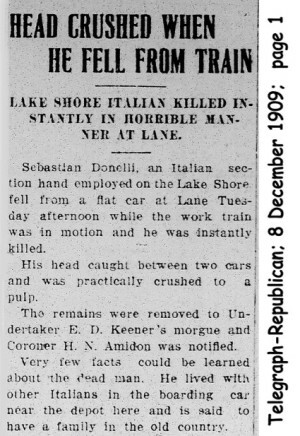 His head was crushed in railroad accident near Lane Road, Perry, Ohio, while working for the Lake Shore Railroad. His body was interred at St. Mary Cemetery at Painesville Township, Lake County, Ohio. Sabastiano Bonelli, age 42, immigrated to the United States at New York City, on September 2, 1903. He was traveling to Sandusky, Ohio, to join Calogero Giordano, his cousin. Sabastiano Bonelli re-immigrates the United States on May 25, 1909. He was travelling to Cleveland, Ohio, with his son, Epifanio Bonelli. At the time of death, Sabastiano resided in a railroad boarding car located near the depot at Painesville, Lake County, Ohio. 1. Epifanio Bonelli was born about 1889, at Licata, Sicily.